I believe that this photograph was taken at the rear of the Black Bull in the early 1950's. 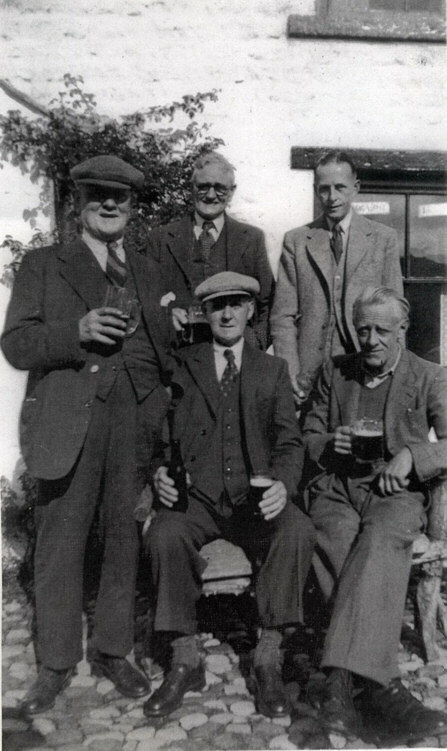 Standing left to right are Tom Lister Ellison; Mr Quinliven, the Sutton postman; Joe Harry Haigh, landlord of the Black Bull. Seated are Ralph Whiteoak in cap and Reg Ellison (Tom Lister's younger brother). Tom Lister, Reg and Ralph were all veterans of the Great War. I remember Reg very well, he and his wife lived in the top cottage on the right in Rosewood Square. He walked badly due to having been wounded in the right leg in the Great War and it gave him continual trouble, particularly in his old age. Records show that he had volunteered in January 1915 via what was known as the Lord Derby Scheme. This enabled men to volunteer but then return to their jobs until such time as they were formally called up. During the period that they returned to work they were entitled to wear a grey arm band with a red crown to show that they had signed up to fight. Reg's papers came through in April 1915 and he joined the Duke of Wellington's West Riding Regiment on 24th April 1915 at the age of 19. He undertook his training at Brocton Camp on Cannock Chase and at Clipstone Camp, near Mansfield. His company formed part of the 5th Battalion and left for France in May 1916 where it joined the 49th (West Riding) Division and were in action throughout the Battle of the Somme (commenced 1st July 1916). Between 23rd July and 3rd September they were engaged in the Battle of Pozieres Ridge (a phase of the Somme offensive) and it appears that whilst advancing during a latter stages of this action Reg was hit in the right leg by a machine gun bullet. The gun shot fractured his right thigh bone but he was fortunate to be rescued and taken to a field hospital. It was later said that army surgeons had wanted to amputate his leg but that Reg had refused to let them. There is no doubt that he was lucky to survive and following his recovery he was declared unfit for further service and discharged on 3rd October 1917. I think Reg died about 1970. Although the photograph is taken at the Black Bull both Reg and Tom Lister enjoyed a pint or two in the King's Arms where I recall chatting with them both about their war time experiences and recollections of old Sutton. 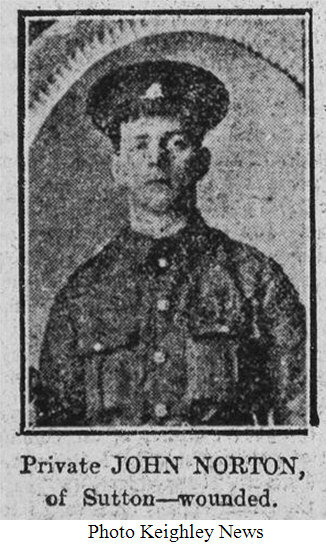 Tom Lister (he was always called by both names) had also joined the West Riding Regiment and records show that he enlisted at the regimental headquarters in Halifax on 22nd January 1915 at the age of 26 and was placed in the 10th Battalion. Unlike Reg, who was single, he was married with two young daughters but like many in the heat of the patriotism that swept the Country, he rushed off to join up "before the war was over". Following his training, he left for France on 26th August 1915 where the 10th Battalion formed part of the 23rd Division. Tom Lister now found himself with the Division on the Armentieres front where they completed a five month spell before being relieved. In March 1916 the Division replaced the French 17th Division on the Clarency front and at the end of May were in action at Vimy Ridge. However he was granted leave to England on 2nd June 1916 for one week but must have spent most of his time travelling, snatching only a couple of days or so in Sutton. He was back on active service in time for the Battle of the Somme and the Division took part in no less than six major engagements between 1st July and 18th October 1916. In 1917 the Division was redeployed to the Ypres Salient in Belgium where they fought in actions collectively known as the 3rd Battle of Ypres. On 7th August 1917 Tom Lister was granted 10 days leave to England, his second and last leave home during his service abroad. Having survived the horrors of Ypres he received his marching orders for Italy and joined the British Expeditionary Force in Italy on 9th November 1917. The 23rd Division now found themselves on the Italian front line at Montello to the north of Venice. Here engagements were fought against the Austrians at the Asiago Plateau and at Vittoria. By the time the armistice was signed on 11th November 1918 Tom Lister having survived over three years at the front unscathed had fallen victim to the great influenza pandemic (more people died of this flu virus than were killed on all fronts during the Great War). He had become ill in early November 1918 and was admitted to hospital in Genoa on the 8th of that month. He was later transferred to Marseilles and finally back to England. He spent over three months in hospitals before being signed off at Morton Banks Hospital in Riddlesden on 27th February 1919. He was finally discharged from the army on 28th March 1919 have served a total of 3 years and 3 months overseas of which one year was spent in Italy. Tom Lister died in 1973 aged 84. "I am now in hospital with a shrapnel wound to the right shoulder, but I am all right, so don't worry, as I will be better soon. I had only been in the trenches about a quarter of an hour when I got hit�. He was obviously cheerful as he continues, �We are having some grand weather here. I see the holidays are off. Well, I have not had any for a good while, but I think I shall have a bit of rest now." However, Ralph quickly recovered, was promoted to Lance Corporal on the 20th August and rejoined his unit in the field the following day. Some three months later he was promoted again to Corporal. His one and only period of leave home came on 5th July 1917 for ten days and he was back at the front on 15th July, this time on the Ypres Salient in Belgium. Only a few weeks later on 5th August 1917 he became a victim of gas shell poisoning and within a few days was transferred to the Hospital Ship St Denis, which was moored at Boulogne. Ralph spent some six months recovering and during this period handed in his stripes and reverted back to a private, his service records states that this was done at his own request on 14th January 1917. His reasons for returning to the ranks remain unknown. On his recovery he did not return to his old regiment but was transferred to the 2/4th Battalion of the King's Own Yorkshire Light Infantry on 4th April 1917. The following day he returned to the front. However within the week he was gassed for a second time and after brief spells in hospital in Doullens and Rouen was sent back to England permanently. He spent the remainder of the war in the 4th Reserve KOYLI on home ground and was finally discharged on 24th January 1919. Having mentioned John Norton I will just add a few words as to how he fared during the conflict. He joined the West Riding Regiment at Skipton, the day after Ralph, at the age of 23. He undertook training at Clipstone Camp, near Mansfield and remained in the 3/6th Battalion, which was a Territorial Battalion, throughout 1915. In February 1916 following a whirlwind romance he got leave to marry Emma Barrington at Kildwick Church. He remained in reserve until September 1916 when he was transferred into the 8th Battalion and finally sent to the front where the battalion saw its first action in the closing stages of the Battle of the Somme near Beaumont-Hamel. His battalion formed part of the British 11th Division and after the Somme moved to the Ypres Salient and where they were engaged at Messines Ridge in June 1917. From Messines the Division were redeployed north of Ypres to Langemarck where on 11th August John and his comrades fixed bayonets and went over the top to engage the enemy. crawled through the partially cut wire, dragging his Lewis gun with him and single-handed dealt with a strong party of the enemy, killing about 20 of them. Immediately afterwards his Lewis gun was blown up by a bomb and three of the enemy rushed at him, but he shot them with his revolver. Later he shot several enemy snipers, and on returning to the original post he brought back a wounded comrade under heavy fire. After treatment in a field hospital, John was sent back to England and his family were delighted when fortune landed him in Morton Banks at Riddlesden. He was discharged unfit for future service on 16th March 1918. Towards the end of his life John lived in Manor Way, Sutton and was a regular at the King's Arms. He died in 1972. The British Army 1914-1918 - for Family Historians. With thanks to Robin Longbottom for providing this article. April 2011.